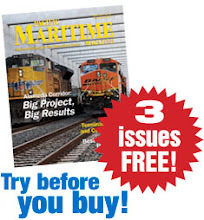 Port Metro Vancouver, Canada’s largest and busiest seaport, saw a 3.3 percent rise in cargo volumes for August 2013 compared with the same month last year, according to newly released data. Metro Vancouver terminals moved a total of 259,790 20-foot equivalent units last month, compared with 242,821 in August 2012. The volume marked Vancouver’s busiest month of the year so far for containers. The majority of the total volume was in full inbound containers; port terminals moved 130,766 during the month, a steep jump over the 123,251 TEUs from August 2012. Outbound full containers made up the second highest percentage; Metro Vancouver terminals saw 105,419 of them last month, compared with 84,968 TEUs during the same month last year. The port saw a total of 23,606 empty containers – outbound and inbound – last month, compared with 34,603 in August 2012. For the calendar year to date, Port Metro Vancouver terminals have moved 1.84 million TEUs, compared with 1.78 million through the same eight months last year, a difference of over 59,000 containers, or 3.3 percent. Within that YTD total, imports are up 2.0 percent and exports up 4.9 percent compared to 2012 levels, according to port data.